I guess not every DXpedition can be a spectacular success story. LEM169 definitely was not. 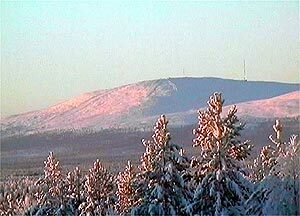 Conditions to the Western hemisphere were mediocre at best, while reception of Asian stations was poorer than I have ever before experienced in Lapland. 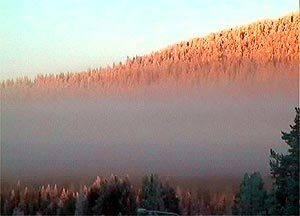 Our total report count is bound to be small, but nevertheless we enjoyed taking a week off just for DXing, surrounded by the beauty of mid-winter Lapland. Jim Solatie's Honda was once again put on the rails to give Jim and Mika Mäkeläinen some rest before a week of intensive DXing. 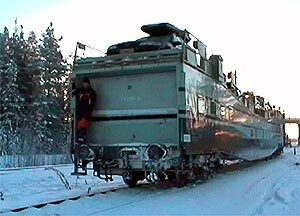 So instead of driving from Helsinki, on the southern coast of Finland, up to Lapland, we slept in the comfort of a sleeping car all the way to Kolari, above the Arctic Circle. The train schedule had unfortunately been changed, and we arrived in Kolari on Saturday morning (Nov. 23) at 10.30 a.m., an hour later than last year. This meant that we wouldn't reach Lemmenjoki before dark. 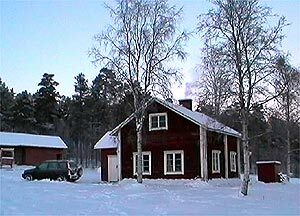 As customary, we first drove up to the winter resort village of Levi north of Kittilä to shop for groceries and enjoy a fillet steak before a week of amateur home cooking. Eventually around 1600 UTC we had everything in place and it was time for that magic moment, switching the radio on and getting the first impression of the conditions on the band. It didn't sound bad at all, a few Alaskan stations were audible even without an antenna towards north, as well as some of the most common Asian MW stations, likewise without a proper antenna. On the first evening we identified for example Thor Or from Sarakham, Thailand, with a local station identification on 1332 kHz - probably the station had increased transmitter power as it was heard also on some other days. 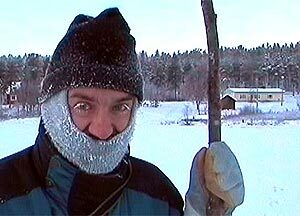 Mika used a long stick to lift and take down the antennas - not the favorite pastime in -35 degrees. We had a rather arduous task ahead of us during the first few days; putting up the antennas. We spent the few daylight hours in the surrounding forest erecting antennas pointing to the Iberian Peninsula, western coast of North America, north (Alaska and Hawaii) and two wires to Asia. Luckily the weather was favourable, -10 degrees Celsius, no wind and very little snow, not more than 10 centimeters, making the job easier than feared. We discovered that several of the coax joints in the cabin were loose, rendering some of the antennas useless, but managed to fix these. Unfortunately, the coax cable of the second Asia wire was obviously broken at some point, resulting in only one usable antenna for the Eastern Hemisphere. Later we were to discover that it actually didn't matter much, as conditions to that area were really poor. 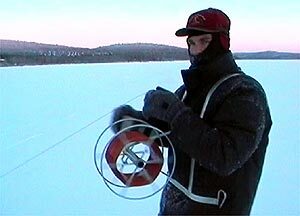 Additionally we laid a shorter wire on the ice pointing to South Asia, but being too short and without a coax feed, it proved to be useless in everything aside from catching interference, so on Thursday November 28, in a freezing -35 degree weather, we rolled it back in. On the following day, luckily in a milder temperature of -25 degrees, we had to repair one of the permanent antennas, because a tree had fallen on the wire. After all these more or less successful experiments and exercises, our antennas and equipment differed only slightly from last year. With receivers lent by fellow hobbyists, both had up to three receivers available, although all three were hardly ever needed simultaneously because of the below-average conditions. Where are the Asians hiding? Afternoons were supposed to be prime time hunting periods for Asia, but this week seemed to be an exception. On most days the mediumwave band was totally quiet aside from a few strong stations from Northern Europe until around 1300 UTC, when stations from Iran and the Middle East gradually became audible. On a few lucky evenings we heard some stations from Thailand and India, but otherwise reception from all of Asia was just miserable. Of course the few upper-band powerhouses like China on 1593, Thailand on 1575, India on 1566 and Taiwan on 1557 kHz were audible almost every evening, but hardly anything else from further east. On Tuesday November 26th and Thursday November 28th a few shortwave stations from China and Vietnam offered a small consolation, but generally also shortwave reception was poor. In the absence of more interesting stations, especially Mika resorted to listening to Iranian stations. In Finland it is considered essential to catch local station identifications whenever there exists local programming, but it seemed that during the holy month of Ramadan also the local announcers were fasting instead of being busy in the studio. In the Western Hemisphere US stations are traditionally the most sought-after targets. On Sunday morning (November 24) we heard stations from the Great Lakes region from 0300 UTC onwards, so the kick-off was promising. In the morning around 0800 UTC stations from the Rocky Mountains were heard, and in the afternoon around 1200 UTC conditions to Oregon (KEJO Corvallis booming in on 1240 kHz) and the rest of the West Coast were relatively good. On Monday November 25 conditions were even better, because they were more focused in the area of Michigan and Indiana. We caught several interesting low-power stations such as WMPX Midland MI 1490 kHz, KNIM Maryville MO 1580 kHz and WHLY South Bend IN 1580 kHz. However, at 0815 UTC US stations disappeared from the dial, and surfaced again only three days later on Thursday, November 28, and much weaker then. 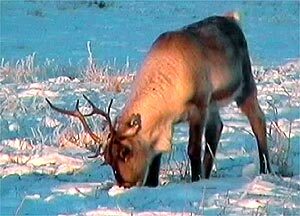 Conditions began to improve gradually before we left so that on Saturday morning (November 30) about 20 Alaskan stations were really strong and a few Hawaiian stations were also audible. We heard nothing from Central America nor the Caribbean - not counting XERF 1570 kHz and Harbour Light 1400 kHz which we didn't bother to identify but which presumably were audible. The northern part of South America was also absent except for a few minutes around 0700 UTC on Tuesday, November 26. Conditions to Brazil, Argentina and Uruguay were moderate during the first few nights, and on Tuesday even until 0700 UTC. Normally on mediumwave the first signals surfaced around 2230-2300 UTC and conditions remained fairly good for an hour or two. Shortwave was dead most of the time. On Sunday November 24 Jim heard ZYJ255 Rádio Brasil Tropical from Curitiba PR on 1320 kHz, which was probably the best catch of the DXpedition. Because of NRK on 1314 kHz it is hard to hear anything on 1320 kHz, let alone a low-power Brazilian from the south. Another very exciting catch from South America was Radio Contemporánea on 1129.8 kHz, the first logging of the station from across the Atlantic. 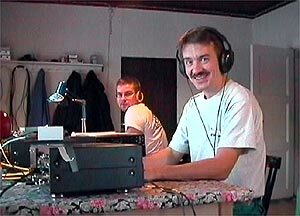 An earlier news item on DXing.info revealed that such a station indeed exists in Argentina, but nobody seemed to know anything else about the station. Luckily I caught the phone number in one of the promotional announcements that I heard, and after several long phone calls - including being interviewed live on the air - I got a verification, the first of the LEM169 haul of stations. The disturbed atmospheric conditions should have favored stations from the south, but we caught nothing special from Africa, Italy nor the Iberian Peninsula. From Greece, ERA Serres on 1584 kHz with local programming was a pleasant catch, one that we had hunted for ages. Greek local stations are often heard at night, but in the late afternoon or late morning, when they have local programming, they are rather difficult targets. As an indication of space weather storms and disturbed magnetic conditions, the A-index remained above 10 during the entire DXpedition. Solar flux dropped from 148 in the beginning to 141 in the end. The disturbances merely repeated the pattern of the autumn months, so we knew we had it coming, and our timing could have been better. We saw massive northern lights late Friday, November 29. The weather on earth was less stormy but also less predictable. We put up the antennas in -10 degrees Celsius, but had to continue working with antennas when the daytime high suddenly fell to a less pleasant -35 degrees. 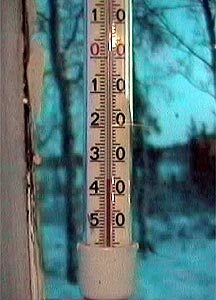 At night we measured -38 degrees. On Saturday we packed our gear at 1 p.m. local time, and left before 2 p.m. to drive back to Kolari via Levi. Later on Saturday evening Alpo Heinonen (LEM170) took over. All in all, judging by the results, LEM169 was much below average, nevertheless with a few interesting highlights. Here is the LEM169 DXpedition log, which will continue to be updated during the upcoming months - so be sure to check it again in 2003. In the log you will also find some audio samples of the station identifications which we heard. For some logging guidelines, check out notes on the log.